Mind the gap! This lovely phrase is used in the London underground to ensure passengers properly step from the platform onto their respective passenger trains without stumbling. There is such a strong career implication in this imagery, as passengers consciously understand and willingly do something slightly different in order to move forward. Define the gap – Big or small, understanding what needs to be overcome is essential in taking that important first step. Plan Ahead & Focus – Once the gap is understood, you really need to focus on how you want to reenter the workforce. What roles and positions would you consider? Which industries? Size of employer? What skill sets are most valued in that area? Are you looking for a full-time role or perhaps a role that has more flexibility given the changes in your life. This will help define the 3 or 4 sets of skills you need to keep fresh during your time away from the workforce. People Hire People – While it might seem basic, don’t forget that your current set of relationships is very valuable to your next step. During your sabbatical, be sure to keep in touch with colleagues, clients and vendors via in-person visits (breakfast, coffee, lunch) or “catch-up” phone calls. Follow-up those meetings with hand-written notes. Volunteer Your Skills – The non-profit community is always in need of talented professionals. Find an organization that resonates with your interests and passions. If you worked in strategy consulting, you can offer your services to help focus their organization. If you worked in finance, you might find ways to squeeze resources on a tight budget. If you have a technology background, you might be able to help the organization upgrade their systems. The opportunities are endless, your work benefits the community and you keep your skills relevant. Consulting Projects – Taking on discreet consulting projects can show that you are using your skill set and adding value to organizations. Attend Trade Events – You need to be “in the know” on current trends in your industry, so attend key functions. Understanding the latest evolutions can help you understand how to position yourself coming back into the workplace. Write & Speak – Your experiences and stories are valuable to a broader audience. For example, don’t hesitate to reach out to a local university to offer your services as a guest speaker to an undergraduate or graduate level class. You might develop a relationship with a professor to do research in your field. Supporting a research project for a professor would be an excellent way to show your range within your field. Additionally, you might have expertise in a particular area that would worth sharing in your industry. Reach out to trade specific publications and offer to write an article on your knowledge of particular subject area. Use Social Media to Track News – You can create “sector specific” news for yourself using multiple social media outlets. Follow key organizations or thought leaders on your twitter feed. Set up google alerts on key industry terms to ensure you are getting up to date news on a particular subject area. LinkedIn also has options to track sector specific news that is useful. Big or small, we all have gaps in our lives. 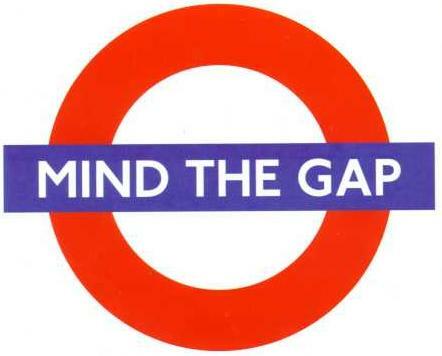 Recognize that you are not alone and that there is plenty to do so you can “mind the gap” into your next career move.